What Happens to My Disability Benefits When I Retire? People nearing retirement age who have already been receiving Social Security disability benefits (SSDI) often wonder what will happen once they are eligible for retirement benefits. For many reasons, adults may suffer an illness, injury, or other medical condition that makes it impossible for them to work, therefore they may receive disability insurance benefits that pay for living expenses. They may also be eligible for Medicaid, which is a public health care program that pays for doctor’s visits, medical services, and prescription drugs. The answer is relatively simple. 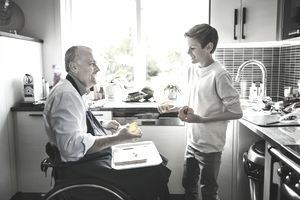 Social Security disability benefits will automatically switch over to Social Security retirement benefits once the individual reaches their eligible age of retirement, generally around 62 to 70 depending on when they were born. If they are eligible for Social Security spousal benefits, they will also receive this payment each month (but must apply for this). In many cases, the monthly amount received will not change much, and may increase depending on how long they worked, if there is a monthly pension, and how much was earned before they became disabled. There are some other special circumstances for people who are receiving Social Security disability benefits. Under the “Compassionate Allowances” determination, the Social Security Administration may provide additional allowances and fast-track benefits for those who are the most disabled and meet certain medical criteria. For example, someone facing a life-threatening illness and nearing retirement age may be eligible for this determination. Qualifying for Social Security disability benefits depends on a few things. An individual must have worked for at least 10 years, and have a medical condition that is determined to be an actual disability under Social Security rules. This can include a catastrophic injury or illness, a physical or mental impairment, or another medical condition that prevents one from holding meaningful employment. A Social Security disability lawyer can help to define these factors to ensure that the individual can get this benefit, and it may take a few years to start receiving monthly disability checks. If a person decides to retire early at the age of 62, their disability payments may continue at the same time as their retirement benefits, but at a reduced rate. For example, if you were near retirement age and decided to retire early due to chronic health problems, you could apply for disability insurance. Once you reach 65, your disability payment will kick in. The Social Security Administration will make up the difference between the disability and the retirement benefits for a short period of time while this transition occurs. The decision to retire is entirely up to each person. It is recommended that you speak with a knowledgeable attorney and financial advisor before taking this step.